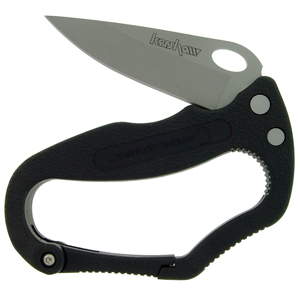 Kershaw Jeeva National Geographic Mini Carabiner Tool. 3 1/4" closed. AUS-6A stainless blade with thumb slot pull. Black injection molded handles with carabiner. Spring-loaded gate holds tool securely closed until released by user. Locking liner for safety. Clips to vest, backpack, camera case or belt loop.